For as long as I can remember, I've been a fan of Super Hero role playing games. My entry into this particular gaming milieu was Hero Games' excellent Champions 2nd edition role playing game. 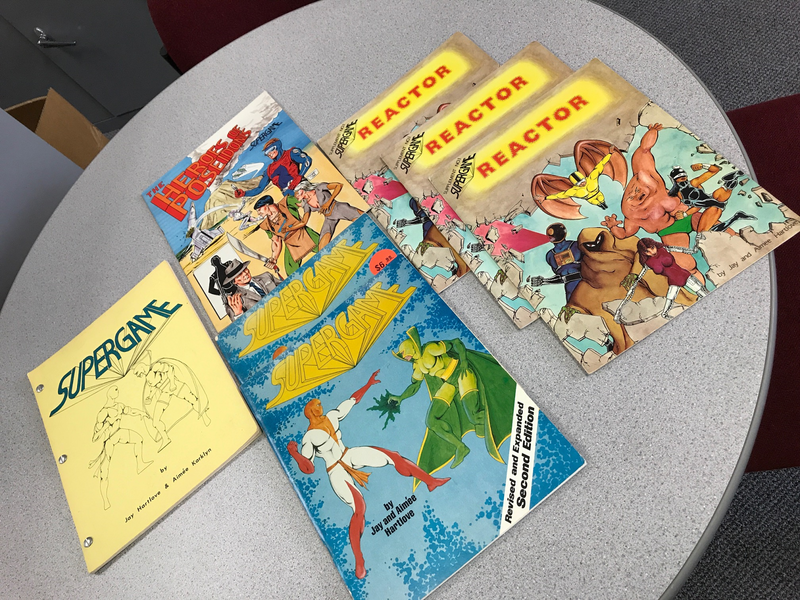 I happened upon a copy and was amazed that game designers had even attempted to capture super heroes using game mechanics. At the time, I was only familiar with Dungeons and Dragons, Star Frontiers, Tunnels & Trolls, and Fighting Fantasy Gamebooks. I had played all three of those games and their mechanical foundations did not prepare me for what Champions offered. Unlike the other games with which I was familiar, Champions did not have randomly created characters and instead allowed players to build whatever they could imagine. The only limit to the character you could design was the number of points available at creation (100 points with 150 more possible if you took Disadvantages). Other than that, it was all good. During my initial Champions experience, I didn't have anyone to play the game with and spent all of my time making characters and doing some solo battles. My character builds were heavily influenced by the sample characters in the rule book and thus were typically of 200 total character points (100 and 100 from Disadvantages). This included my personal write ups for the X-Men. I was content with my view of the game, but this view was to be shattered in short order. A couple of months after I discovered Champions my family moved to a new city, I finally encountered a group of gamers who played the game every weekend. Given that this was the Bay Area, and the game company was a Bay Area company, I soon discovered a rich and vibrant Champions community. I also discovered that how I interpreted character adaptations to the game was very different from others. Some of that difference, I maintain to this day. I personally believe that too many gamers inflate the stats of their favorite characters out of love for the character, rather than an examination of benchmarks and mechanics of the game. But these are things that can only be understood through play, and that was something I had not yet done with Champions. In playing the game, I learned how some combinations worked better than others and I learned that other players were much more likely than I had been to "grab" the "Obvious and Accessible" items some characters used in combat. Not that I designed a lot of those kinds of characters, I didn't, just that I had expected gamers to behave more like the characters in comics than like "tactical gamers" and that the rules treated gamers as tactical gamers while allowing them to behave like characters in comics. Long story short, I learned that you can only truly judge the quality of a game by playing it. I still love Champions and think it is one of the top 3 or 4 super hero games out there, but my view is now grounded in experience of how the game works and how when some character building norms take over the game can slow down significantly and lose some of its charm. Eventually, my love of super heroes and super hero games led me to purchase Villains & Vigilantes, Marvel Super Heroes, and DC Heroes, all of which have there charms. At one point in time, not that long ago by some standards, I could claim to own a copy of every super hero rpg published (at least in one of its editions). With the explosion of pdf based publishing, that is no longer the case and I'm sure I'm missing out on some great games, but I also have a HUGE backlog of games I'd like to play...see how I'm pulling this back to the question of the day? Among that backlog is Jay Harlove and Aimee Karklyn/(Hartlove)'s early Supergame. 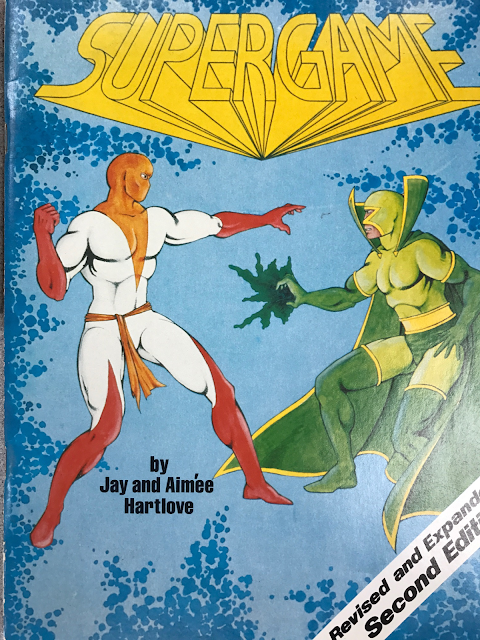 It wasn't the first super hero rpg published, that was Superhero 44/Superhero 2044, but it was one of the first and predates Champions. Both the first edition and revised edition came out in 1980. I discovered the game as a "real" thing and not just something mentioned in old gaming magazines, when I moved to Los Angeles after graduating from college in 2000. I was looking for gaming stores and found a long standing game store in Long Beach that had a copy of the 1st edition. Later searches on the internet have shown me that I got a significant bargain on it, as I did with copies of Warlock and a couple of other games originally designed by the Southern California gaming community. 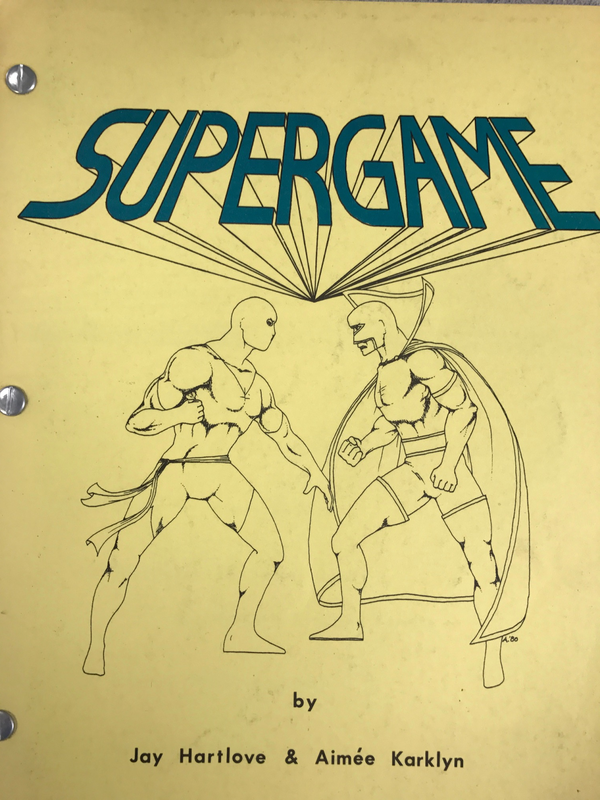 Supergame, like Superhero 2044 which predates it and Champions which comes after it, has a point based character creation system. It also has an interesting skill and combat system that I think has a lot of potential. Some of the stats are odd in how they are presented. For example, if a character has an Agony score (similar to Stun for Champions fans) of 10 or more they suffer no penalties to how they move or act. Given that scores start at 0, and that some sample characters have 0s in other stats implying that a score of 0 is sometimes the "average" score, it seems odd that a person has to spend points just to be a normal person in some areas and not others. Why not just have stats start at "average" and let people buy them down later? Or why not have Agony start at 0 with no penalties and allow negative scores to cause impairment? It's a small complaint, and there are a number of neat features like different defenses against different types of attack (pre-Champions remember). A thorough reading of the rules, both editions, and the supplements has convinced me that I need to play this game to evaluate whether the designed characters are effective at all in a way that would be fun. There are far more characters who have an Agony of 10, or a Physical (like Hit Points but with those with less than 10 being hurt), which means that if they suffer just 1 point of damage they will be impaired. I think there is a very good game buried in the Supergame rule books, but I think it is a game that needs a lot of play testing and rules tweaks to bring out that game. I applaud Jay an Aimee for their hard work on the game and their ability to get a game like this published in 1980, and this is definitely a game I wish I was playing right now. I have so many questions I'd like answered and I'd love to house rule this game into a more complete system.